We’ve all attended the same school. The School of Hard Knocks. The day we were born, we were learning. Who feeds us, and what to do to get them to feed us. How to walk, how to talk, how to feed ourselves. How to play, how to get things done, how to rest. And we were curious! That ant, where’s it going? That dog looks soft, is it? I want that thing on the shelf and—ouch!—it hurts to fall down! We watched as the older people in our family interacted with each other, with their friends, with neighbors and strangers. When they interacted with us, we heard them and saw them and felt them. And we figured that’s how it’s done. That’s how things work. We're still in the School of Hard Knocks. We’re still learning how life works—by experience. This is how Jesus taught. All things new...now, or not until the end? Is God “making all things new” now or later? Now means right now, in this present time, our mortal existence marked by days and months and years. Later means the end of the world. This certainly applies to the end of the world. John had just witnessed the arrival of the new sky and the new ground, and the new Jerusalem (Rev. 21:1-2). Does that mean God will only make things new after the world ends? This verse reminds me of another favorite (thank you cross-references). As a result, anyone in Christ is a new creation! The original things moved on. Look! New things have happened! This verse is clearly in the present. God’s not waiting until the end of the world to make things new. He’s making things new right now! But there is a difference. At the end of the world, God will make everything new. Right now, God is making people new. If you are in Christ, you are a new creation—right now! Indeed! I can make all the plans I want, but God’s plans are the ones that will really happen! I was struggling with the message this week—the first sermon of the new year for my church. It’s called “Hope for When the Bottom Falls Out” and it’s based on the destruction of Jerusalem and exile of nearly all the Jews (2 Kings 25 and 2 Chron 36). Not exactly an inspiring passage. I wish I could preach it like my colleague, who wrote the title and already prepared his sermon and showed it to me. But I just couldn’t get in the right frame of mind--his frame of mind. “I guess I’m just not as good as my colleague.” I bemoaned my pitiful state to God. Later, I realized one of my hopes for the new year: that I would care about my church more. That I would be warmer and more approachable. It’s my hope, but I think it’s God’s hope, too. So I kept the title (it’s already printed) but I put aside my colleague’s sermon. I will speak to the church about the hope we have in God. I will speak about my hope in God, my trust in God. I will encourage and invite them to do the same. To outsiders, it was just a fish. But to Christians, it was a reminder of Jesus the Christ. What do people see? A fish. The first Christians had enemies among Jews and Romans, government and citizens. It was not always safe for Christians to identify themselves. So the Christians adopted a symbol as their code--the fish. Here is a visual guide to simple Bible study the RAW way. You have some Bible software. 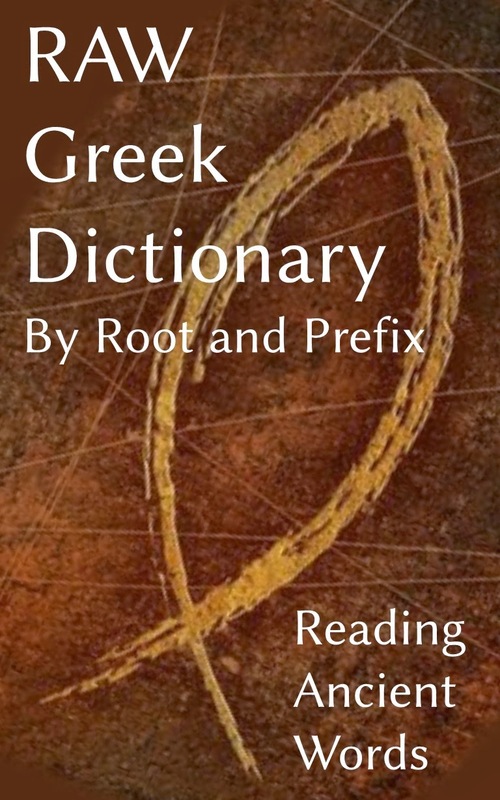 And you have a copy of the RAW Greek Dictionary. So... what's next? Is a "direct translation" possible? The author calls for a "direct translation" of the Bible. This is in contrast with the recent "functional equivalence" translations so popular at the time (way back in 2001). Thirteen years later, we are flooded with new and updated translations--but they're almost all Functional Equivalence! NLT, NIV, TEV/Good News Bible, CEV, the Message, and many others are born from this method. Functional Equivalence translations are certainly easier to read, but they are also, understandably, less faithful to the original text. Direct translation is possible, and necessary. 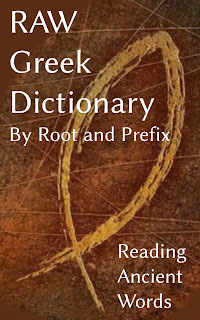 (C)2017 Reading Ancient Words with Kristofer Tripp. Background by Nicolas Raymond. Picture Window theme. Powered by Blogger.